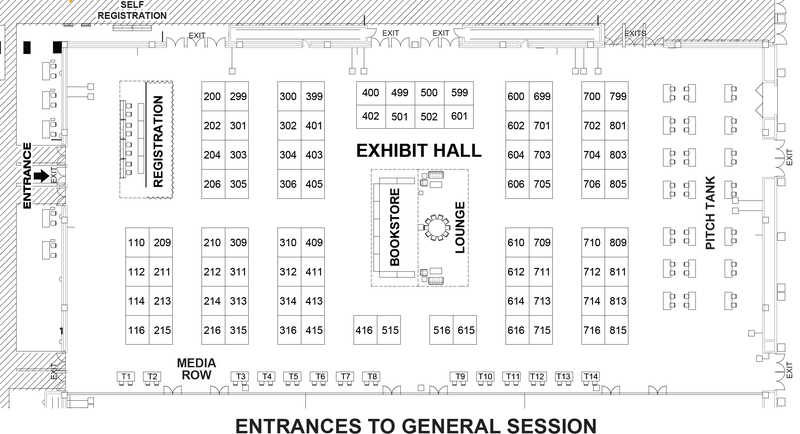 Find all the information for additional booth materials such as A/V, internet services, and furniture here. Booth location is assigned by the FreedomFest team and is based on sponsorship level and the date on which payment was received. The FreedomFest team strives to integrate sponsors from all different sectors and industries to create a diverse exhibit hall experience and to optimize exposure for your organization. Freeman Discount Deadline is June 20. Single Booth: Each 8′ x 10′ booth will be set with 8′ high gray back drape, 3′ blue high side dividers, one 6′ gray draped table, two side chairs, one wastebasket, and a 7″ x 44″ one-line identification sign. Double Booth: Each 8′ x 20′ booth will be set with 8′ high gray back drape, 3′ high blue side dividers, one 6′ draped table, four side chairs, two wastebaskets, and a 7″ x 44″ one-line identification sign. Table Top: Each table top exhibit will be set with one 6′ gray draped table, two side chairs, one wastebasket, and a 7” x 44” one-line identification sign. Exhibitor Move Out: Saturday July 14, 2018 2:00 p.m. – 7:00 p.m.
Click here for Internet Services. Note: FREEMAN will accept crated, boxed or skidded materials beginning at the above address on June 11th, 2018. Materials arriving after July 3rd, 2018 will be received at the warehouse with an additional after deadline charge. Warehouse freight will be delivered prior to exhibitor set up. If warehouse freight has to be moved in on a weekend in order to be in the exhibitor’s booth for move-in day, an overtime charge may apply. Warehouse receiving hours are 8:00 a.m. – 3:30 p.m., Monday-Friday. Due to limited material handling services at the facility, all exhibitor freight should be sent to the Freeman warehouse. Please note: All items and materials that must be brought into the facility may be subject to Material Handling Charges and are the responsibility of the Exhibitor. This also applies to items not ordered through the Official Show Vendors. We are pleased to announce that we are using Opportunity Village, a Vegas-based charity, to take care of our program bags this year. All program bag inserts (fliers, etc) must be delivered to Opportunity Village no later than June 25th. All Platinum and Diamond exhibitors receive one program bag insert as part of their sponsorship. Fliers, brochures, pamphlets and small products, freebies or publications are welcome. Sponsor is responsible for printing/manufacturing and shipping/delivery by deadline. To purchase a program bag insert, or if you have any questions, please contact us at info@freedomfest.com or 855-850-3733 ext 3. TWO LAS VEGAS PRINTERS – if your bag insert is a flyer or other simple print project and you wish to use a local vendor. When ordering, add “Referred by Freedom Fest” in the notes/special instructions area when submitting. You can call them directly if you have questions but they prefer orders being submitted either online via their website or email. Delivery is Free on orders over $150 before tax, otherwise it is a flat rate $35 delivery charge. Yes! OV can print your flyer – no delivery fee! Considering something that stands out a bit more than a flier or brochure? Contact Anna at 4imprint.com for all your product and branding needs! Make collecting contact information fast and easy! Use your cell phone, tablet or other handheld device. Lots of options so you can click and store valuable contact information from interested attendees. We have arranged for Event Ready to host our Lead Retrieval this year. They will be onsite and able to help you with any needs during the conference. Cancellations on sponsorship initiated in writing to info@freedomfest.com before April 30 are 50% refundable. Cancellations after May 1 are not refundable. Full credit can be transferred for FreedomFest 2019. Special events purchased by exhibit staff and speakers are 100% refundable before June 1, 50% refundable between June 1 and July 1, and are non-refundable after July 1.